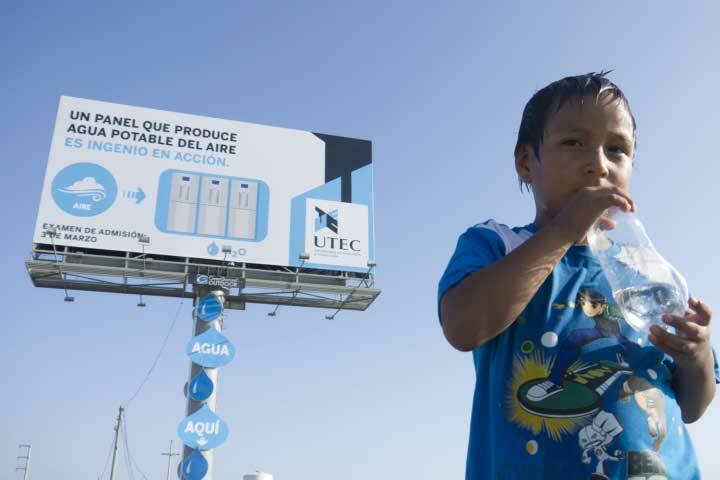 UTEC and Mayo DraftFCB teamed up to create an amazing water treatment billboard in Lima, Peru, the second largest desert capital in the world. It rarely rains in Lima – the city sees perhaps half an inch of precipitation annually – and many of the 7.6 million residents have limited access to clean drinking water. More than 1.2 million people lack running water entirely and are forced to gather their water from unsanitary wells or pay an extortionate amount of money to unregulated private-company water delivery trucks – usually 20 times what more well-off residents pay for the luxury of residential running water. Though the city is part of the driest desert in the world, the average humidity hovers around 83% (it’s actually closer to 100% in the mornings!). Leave it to a team of engineers and an ad agency to turn staggering humidity into a positive. In an effort to create something splashy to kick off UTEC’s application period for 2013 enrollment, they developed a concept using a series of five tanks located at the top of a billboard which could hold up to 96 liters of clean drinking water at any given time. The magic part? 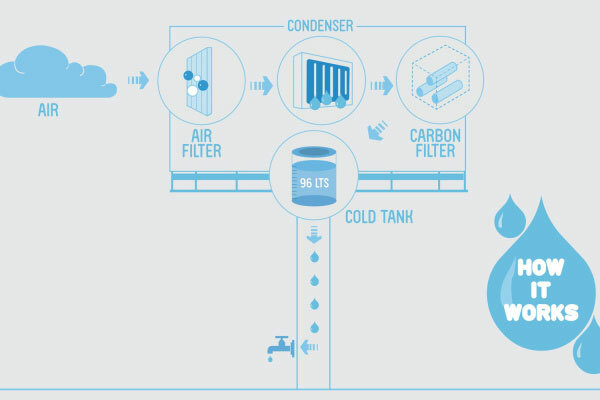 The water is literally produced by harvesting moisture from the air and processing it through a basic filtration system. Gravity aids in dispensing it via a faucet at the bottom of the billboard. Just like that, up to 100 liters of potable water is produced each day, and can be accessed by anyone who opens the tap. It’s not entirely self-sufficient, requiring electricity to power the inverse osmosis filtration system, but in just three months, the billboard produced about 9,450 liters (2,500 gallons) of water, which equals the water consumption of hundreds of families a month. Just imagine what a dozen, hundreds, or even thousands of these billboards could do, not just in Lima, but in any number of places around the world with a shortage of potable water.